The stoppage came days before the US planemaker was due to make its first delivery of the aircraft to a customer. But Boeing said it was sticking with plans to begin MAX deliveries this month, adding that production of the jets would continue. American Airlines, Southwest, and China's Shandong Airlines are among those who have placed orders. Earlier this year Indian airline SpiceJet placed an order for 205 new planes from Boeing, in a deal valued around $22bn (£18bn). Boeing had said the first of the Max 737 planes would be delivered to SpiceJet in 2018. The MAX fleet is designed to be a more fuel-efficient version and replaces Boeing's previous 737 model which has been a best-seller for the aerospace giant. Boeing says it was notified last week of a potential issue involving turbine engine discs manufactured by a supplier to CFM International. CFM is the joint venture between US firm General Electric (GE) and French-based Safran - the companies making the engines for the 737 Max fleet. Boeing says it has not experienced any problems with the discs during more than 2,000 hours of testing. "Out of an abundance of caution, we decided to temporarily suspend MAX flights," it told the BBC. "The step is consistent with our priority focus on safety for all who use and fly our products." The 737 MAX 8, the first version of the plane to be built, carries a list price of $110m but airlines generally receive steep discounts. The next model, the 737 MAX 9, has more seating capacity. That aircraft completed a successful maiden flight last month. Sales and profits slipped at Boeing last year, mainly due to lower deliveries of its military aircraft. The US aerospace giant celebrated its 100th year in business last year. 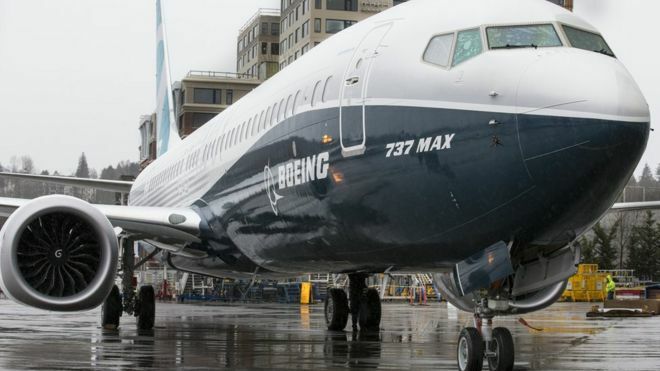 Boeing has temporarily halted test flights of its new 737 MAX aircraft due to possible issues with the engine, BBC reports.